A long time ago in a galaxy far, far away, George Lucas created a franchise that would invade pop culture like no other. Star Wars is a universe divided: an excellent trilogy followed by three awful prequels. Yet this division is something that unites the fans, as rarely will you find a Jedi wannabe who favors Jar-Jar Binks over Master Yoda. I'm not of a very different mind on this matter, though I have previously argued that even the prequel trilogy has its redeeming moments. If I have to choose sides, I just can't help but root for the underdog. 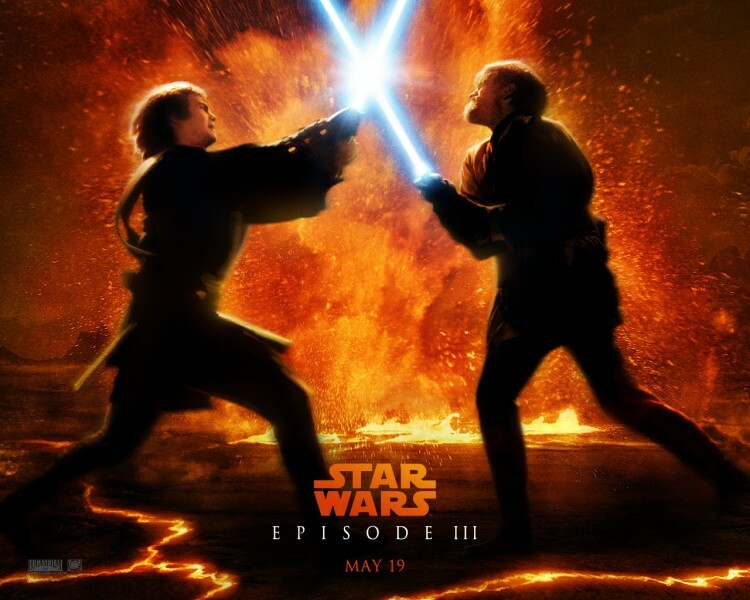 What is less often considered is the six series as a united whole, and the impact the prequels have on the original trilogy. Have you ever watched all six movies not in release order, but in chronological order? If so, did you notice some things that didn't make sense before suddenly take on a whole new meaning? One creative author has organized all those threads into a logical supposition. In Keith Martin's reconsideration of Star Wars IV in the light of I-III, two characters that have always been fan favorites are cast in unexpectedly prominent yet subtle roles. Think the heroes of this film were Luke Skywalker and Han Solo? Think again. As unlikely as this casting is to be canon, it's an imaginative — and seemingly plausible — interpretation that gives George Lucas' galaxy more depth than even he intended. If you have time to read this 2,299-word dissertation, you won't be disappointed. One point in the above essay that I had to question: was the Millennium Falcon anywhere in the prequel trilogy? I don't remember. I know it defended Earth from the Borg, roughly a century after R2-D2 went up against the Romulans. So it's entirely possible these characters would show up unexpectedly in their own franchise. Whether or not you approve of his coda to the Star Wars movie series (the tenth anniversary of Episode I's release being this coming Tuesday, May 19th), Mr. Lucas is still the man who introduced us all to a galaxy far, far away, leaving an undeniable impact on pop culture and the imaginations of millions. It's worth noting that the above video is not a live performance, but is actually a lip-sync of a song by a quartet called Moosebutter. I'm not sure why this one-man version was the one that became popular, but to his credit, he never claimed the song as his own, giving full attribution to Moosebutter. Beyond Star Wars, other singers have also proven their versatility in playing multiple roles. For more such fun, turn your attention to Beaker and one Zelda video game fan. Filed under Star Wars; 5 comments. I was recently editing an article about how to convert one format of digitized sound effect (rSound) to another (WAV). It's a pretty geeky topic, but one I think will appeal to the right audience. Despite that esoteric pastime, even I have to say that some people have way too much time on their hands. Translating sound effects via digital means, I can understand — but reproducing Star Wars theme music "on the metal"? At least this second example was mere happenstance and involved no real work… unless you count the unlikelihood of a Wookie amicably squeezing himself into a cabinet. And to anyone who tells you not to vote today… it's a trap! Filed under Star Wars, Trailers; 4 comments. Star Wars has inspired some fantastic fan films, from Chad Vader to Ryan vs. Dorkman. As artistic and engaging as these creations are, they are usually limited in their budget and scope; few are more than a few minutes in length. Meanwhile, more ambitious projects, such as Heart of an Empire or 5/25/77, never see the light of day. Although I'm not always a fan of either Seth Rogen or Kristen Bell, this star-studded film looks like a ton of fun for anyone who knows Star Wars and Star Trek as well as the typical Showbits reader. A healthy dork is one who can laugh at himself, and I suspect I won't be alone in counting myself among that crowd come Fanboys' opening night of February 6, 2009.